Psychologist Dr. Annette Childs, author of Will You Dance?, talks with the Association for Death Education and Counseling (ADEC), and shares tips for journeying from grief to healing. Grief and loss are short words that have the power to bring even the strongest people to their knees. 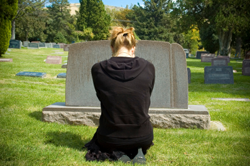 Dr. Childs began to see grief as faceless visitors with intense strength. Today, she helps hundreds of families each year who are suffering from a loss. Watching this unfold for so many is what inspired Dr. Childs to write her book, which is a companion to grievers around the world. It tells the story of three visitors (Change, Loss, and Fear) who are hooded figures that arrive at your door. They come no matter how you’ve lived your life. At some point, this trio will knock on your door and change your life. You have no choice but to answer and let them in. You realize they’ve come to set up house, and your only choice is to surrender. However, over time you get used to their presence. You eat dinner with them each night—they are your companions. Over time, you accept gifts from the trio. These gifts help transform you and bring you to a place you’ve never been before. When there’s a new knock at the door, it’s Hope, Faith, and Joy. Perplexed, Loss says to you, “In the ways of the Universe, Hope, Faith, and Joy can only arrive…after we’ve traveled ahead and made a space for them.” Seeing these visitors can be scary, but it’s necessary. One day, the second trio will arrive. “We are meant to dance with it all,” Dr. Childs explains. When the first trio arrives, know they are early messengers. The circle will fill soon.